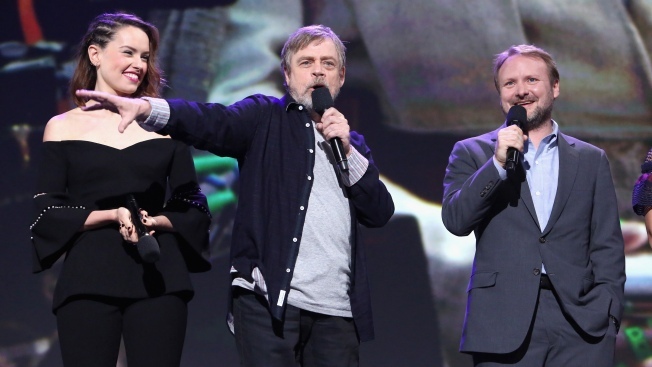 Actors Daisy Ridley, Mark Hamill and director Rian Johnson of "Star Wars: The Last Jedi" took part in the Walt Disney Studios live action presentation at Disney's D23 Expo 2017 in Anaheim, Calif. The film will be released in U.S. theaters on December 15, 2017. The Force is still strong in Rian Johnson. Lucasfilm announced Thursday afternoon that the 43-year-old writer and director of "Star Wars: The Last Jedi" will create a brand-new Star Wars trilogy, the first of which he is also set to write and direct, with longtime collaborator Ram Bergman onboard to produce. "We had the time of our lives collaborating with Lucasfilm and Disney on The Last Jedi. Star Wars is the greatest modern mythology and we feel very lucky to have contributed to it," the filmmaking duo said in a statement. "We can't wait to continue with this new series of films." "We all loved working with Rian on 'The Last Jedi,'" Lucasfilm president Kathleen Kennedy said. "He's a creative force, and watching him craft The Last Jedi from start to finish was one of the great joys of my career. Rian will do amazing things with the blank canvas of this new trilogy." Johnson's films, separate from the episodic Skywalker saga, will introduce all new characters. No release dates have been set yet, and per Lucasfilm, "no porgs were available for comment."